The Angels won 100 games in 2008, but their pythagorean record said they should have won 88. Hey, sometimes it’s better to be lucky than good. On the other hand, it’s never a good idea to count on being lucky. So what have the Angels done this offseason to ensure a repeat 100-win performance? The team lost free agent 1B Mark Teixeira to the Yankees — not a good start. Record-breaking closer Francisco Rodriguez went to the Mets, and L.A. made no attempt to retain longtime Angel Garret Anderson, though that shouldn’t hurt too much. On the plus side, the Angels recently signed Bobby Abreu to a one-year deal. He and Vlad Guerrero will take turns playing RF and DH. L.A. also signed free agent closer Brian Fuentes and they re-signed OF Juan Rivera, who figures to play a more prominent role in 2009, especially if he can channel his 2006 self. How does it all shake out? LA’s bullpen figures to be a strength once again. K-Rod had a record breaking year in 2008, but the truth is his performance has been declining over the last several seasons. Fuentes will make a fine replacement. Replacing Teixeira was going to be harder, especially considering LA’s unwillingness to sign Manny Ramirez. The Angels settled for Abreu, who will add much needed OBP, and seem set to hand 1B to Kendry Morales, who Bill James predicts will OBP .327 and hit 19 HR. Not exactly Teixeira-esque (or even Mike Jacobs-esque, for that matter). 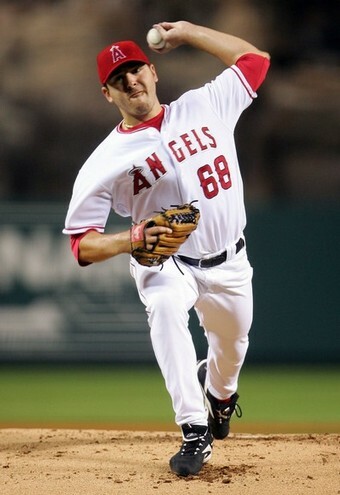 The x-factor for Los Angeles will be Juan Rivera, who is currently penciled in as the team’s LF. If he gets his act together, he figures to be an above average LF. That’s a big if, but even if Rivera is just an average outfielder he’ll still represent a significant upgrade over Gary Matthews Jr., who is finally being relegated to bench duty (and not a moment too soon). It’s also going to be interesting to see how Vlad Guerrero plays in a contract year, if Mike Napoli can live up to high expectations, and if Kendrick can finally fulfill his promise. Added: Bobby Abreu, Brian Fuentes, John Garland. Lost: Mark Teixeira, Francisco Rodriguez, Garrett Anderson. The Angels have gotten a lot worse at 1B, but have improved their DH/OF depth by signing Abreu and letting Anderson walk. The net result is an offense that Baseball Prospectus predicts will score 13 more runs in 2009. So why are the Angels predicted to win four fewer games? Simply put, the team’s pitching isn’t expected to be as lucky as it was in 2008. Saunders, in particular, is projected to fall off a cliff. BP projects he’ll throw 40 fewer innings and his ERA will go up by more than a full run. Saunders’ 2008 babip, an unsustainably low .267, probably accounts for that projection. But Angels fans can take solace in the fact that their team is still a favorite to win the worst division in baseball and their biggest competition, the Oakland A’s, have a slew of question marks. Jon Garland doesn’t even warrant a mention as a loss? Also, any idea what Escobar’s prognosis is? Garland does (barely) warrant a mention. I forgot him. Oops. Escobar doesn’t figure to be ready for the start of the season, but could be in the rotation by the all-star break.